Hanss Acoustics made its debut here with the T-30 turntable, one of three high-mass, multi-motor designs that it produces. Despite the presence of phono stages and even a record-cleaner in the range, it's not just an analogue company, as the CD-20 CD player proves. Like the turntables, the CD-20 is a substantial beast with high build and ﬁnish quality for the asking price. In fact, the all-metal remote, which is styled to match the player, is extremely attractive. 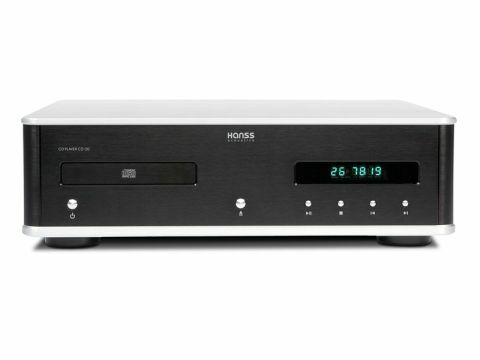 Compared to other CD players on the same price range, it's low on features, but has all the essentials in the RCA phono and XLR analogue outputs and a lonely coaxial digital output. Optical outputs have their uses, but not many audio enthusiasts make them a ﬁrst choice. The CD-20 has switchable upsampling from the remote to a whopping 705.6kHz which is 16 times the standard 44.1kHz sample rate of CD, but only four times the 176.4kHz produced by the pair of Burr-Brown PCM1792 DACs it houses. Hanss uses four Burr-Brown op-amps in the output stage to produce the balanced output available on the XLR connections. Interestingly, the quoted distortion ﬁgures for this output are considerably lower than those for single-ended outputs, suggesting that these RCA phono connectors are hooked up to a valve output stage. Although no mention is made of the fact in the spec, the ventilation holes under the box piqued our interest sufﬁciently for us to take the lid off and reveal a pair of ECC85-equivalent 6N1 double-triode valves. With no way to select between the different outputs (apart from when a balanced line is connected and the unbalanced outputs are disabled), it is likely that the unbalanced outputs are derived from one-half of each differential pair of the balanced lines. This would explain the performance of the unbalanced outputs, which are very lacking. We measured 2.5 per cent THD+N over a 1kHz test tone at 0dBFS, while the balanced outputs achieved an exceptional 0.004 per cent. The frequency response suggests that the two stages are separated after any audio-band filtering, while the distortion figures suggests the unbalanced output is fed at the last possible point and with minimal or no noise filtering. Maintaining a high standard on the unbalanced output has proven too costly or difficult to engineer in addition to maintaining a well-balanced output stage. The blind panel heard the CD-20's single-ended outputs as it did for all the other players and having auditioned the two options side-by-side, we suspect it's best that way. The tubes on the single-ended side have a distinctly mellowing effect, which helps the CD-20 to produce a ﬂuid and relaxed, if slightly dark, sound that's a little short on energy. Initially, the panel reported an "open and airy" sound with a "wide soundstage" and "good bass that's tight and full". This impression didn't continue throughout the programme, however, and after a while the novelty seemed to have worn off, with complaints that the sound was "ﬂat with no sense of depth". The results weren't signiﬁcantly more consistent the second time around, where a panellist enjoyed its musicality. But not everyone was so positive and there was some dissent regarding a "lack of bass weight" and "poor image-projection". In its defence, this isn't a particularly expensive one-box machine, and it can clearly make music if your tastes are for the acoustic rather than the electronic.